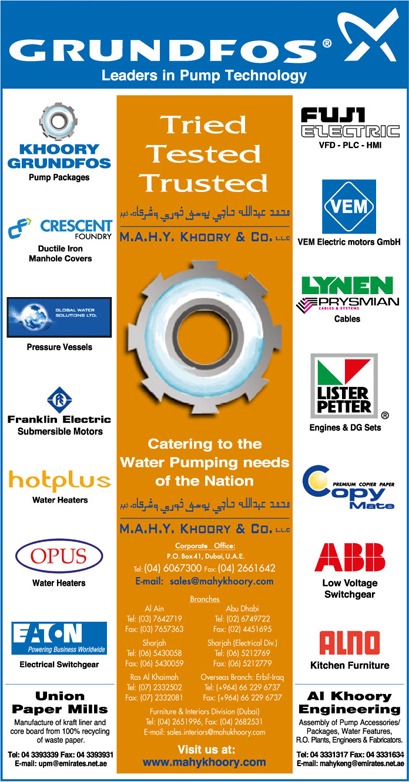 Welcome to the leading name in innovation and technology, the MAHY Khoory Group. What started off as a handful of people, today is a huge conglomerate of over 2000 people, across the Middle East recognized as the leading name in Water Pumping Solutions, Electrical Solutions Recycled Paper Manufacturing and management and Logistics with varied and reputable partnerships like Grundfos, EATON, Lister Peter, Kirloskar, ALNO, DOUBLE A, to name a few. With in-house design, service and logistics teams in place, M.A.H.Y. Khoory offers a 360-degree solution to all its clients addressing their needs of planning, customization and implementation. Pump Systems at The Burj Khalifa & The Palm Jumeirah are few of our many living examples of innovation & technology.